next April 2, 2015 2:38 p.m. The X Stat, says RevMedx CEO Andrew Barofsky, "represents a totally new way to treat these types of wounds." Bullet wounds have long been treated with gauze and externally applied pressure, but instead the X Stat uses sponges to apply internal pressure and absorb blood much more quickly. It’s an elegantly simple solution—one of those "Why didn’t I think of that?" ideas. In fact, one of the company’s co-founders was shopping in Williams-Sonoma when he passed a shelf of sponges and inspiration struck. But the X Stat's technology goes far beyond that of an average kitchen sponge. The device encapsulates dozens of tiny sponges in a tube, with a plunger on one end. It looks a lot like a tampon (which Barofsky admits was another inspiration) and is simple to operate: A medic can insert one end of the tube into a bullet wound, push down on the plunger, and release the sponges into the wound. The sponges then expand up to 15 times their original size, putting enough pressure on ruptured blood vessels to stop bleeding. The impetus for creating the X Stat came from the military, which contacted RevMedx in 2008 during the Iraq War, when battlefield medics needed a better way to stop soldiers' bleeding until they could be brought to a hospital. Right now, X Stat is still only available for combat use, but eventually Barofsky hopes to see it used in civilian emergency situations (car crashes, shootings, fires) too. MAR glue, on the other hand, will start off in the hands of civilian doctors and surgeons. Like X Stat, the glue also aims to stop bleeding, but it's meant for a different type of wound — not the sudden tear of a bullet, but the slick slice of a surgical knife. Most surgical glues on the market today, Rao said, work by accelerating clotting — they don’t actually fuse tissue together. With MAR glue, surgeons can put the skin tissues directly together, and the body heals itself without any clots in the way. Other advantages: The glue dries in 30 seconds; it's unusually flexible; it can be stored at any temperature. It’s also biodegradable, so it dissolves automatically whether it’s inside or outside the body. The rate at which it dissolves can even be programmed: 30 days for a quick-healing wound, or 90 days for a wound that needs more time. 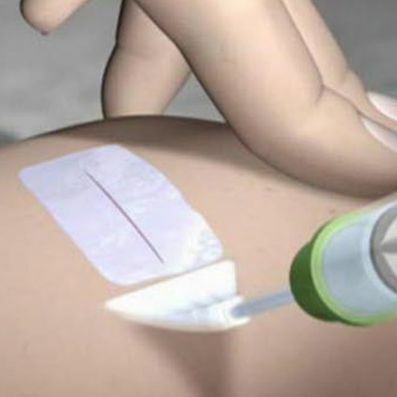 Wound-packing sponges and instantly sealing flesh-glues might already feel like a Jetsons episode, but both companies have plans to go even further. RevMedx is working on devices to stop postpartum hemorrhages — again using super-absorbent sponges — and future MAR glue will appear in aerosol form. Band-Aids might still be today's staple, but it surely isn't long before MAR glue or the sponges used in an X Stat device replace the familiar square cardboard box in your medicine cabinet.